Toronto J-Film Pow-Wow: "Ninja Kids!" to go the remake route in North America? "Ninja Kids!" to go the remake route in North America? With the decade-long "Harry Potter" series of films finally wrapping up there will obviously be a big hole in theatres for kids (and kids at heart) who want to make an annual cinematic visit to a wondrous wizard school. Maybe instead of studying wizardry kids may want to enroll in a course the in ninja arts...? 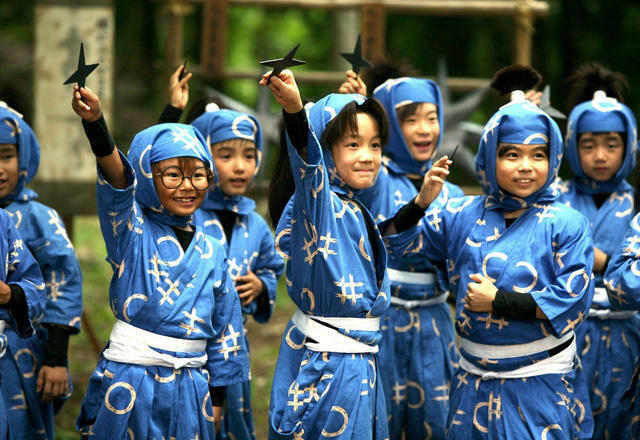 As many of you already know Takashi Miike's latest film "Ninja Kids!" has been riding high at the Japanese box office as well as making waves at international film festivals like this year's New York Asian Film Festival. The film is a live action adaptation of Sobe Amako's classic animated series based around a class of children studying at a school for ninja. Apparently director Miike recently let slip the fact that along with interest in theatrical and DVD distribution rights for his film there has been "a major U.S. production company" who would like to produce an English-language remake. Miike, nor anyone at Toho, have let drop any other bits of information about this, but as we just said, with "Harry Potter" on the way out we'll need something to fill the void. More on this as the story develops. Thanks to Tokyograph for this.